Page of Pentacles (R) says your views are not appreciated by those around you – understand that those feelings can bring unfavorable news. Do not become rebellious – remain receptive to your desires to resolve the major issues in your life and restructure relationships. Relax now – the difficult task has been completed. Rest – center yourself within and trust in the power of God to turn your situation around. Unpredictable, not a self-starter, not in touch with the body or the inner self. Basic physical deficiencies. Out of phase with the physical environment. Inability to seize physical opportunities. In the first position: Allow yourself to play at life, to enjoy fully the simplest of things. This is not to literally remain a child or to avoid responsibility, but to cherish these qualities in the face of those who would have you give them up. In the second position: In a rare case, you might have become literally dependent on a young child for your support. In the third position: You are the agent through which this Page can deliver his/her gifts. In the fourth position: Extremes – distorts into the love of the wild, the untamed and thus a rejection of the process civilization, of growing up, of becoming fully human. 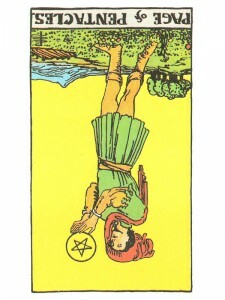 In the seventh position: You may fear this child or what he/she represents. In the eighth position: You may reject this child, or he/she may reject you.